The JSP Iterator utilizing the doAfterBody() strategy by repeating the body substance of any tag. TagSupport tag which executes the IteratorTag interface, can be utilized for emphasizing the body content. One have to utilize EVAL_BODY_AGAIN consistent in the doAfterBody(). JSP Iterator – Before the example one should have to learn tag lib, The JSP Taglib was introduced in JSP 1.1. These libraries allow the addition of tags similar to jsp:forward, jsp: include with different prefixes. The JSP Taglib directives are used to define tag library with a prefix that can use current JSP page. JSP Taglib might include several tag libraries. Following are the steps to be performed while working with custom tags. Write the code to JSP file that should use TLD file. JSP Iterator – In the URL just placed a link, prefix attribute informs a container what bits of markup are custom actions. Here Java class name has been declared with it’s package name. SKIP_BODY is an optional returned value but this value must be returned by doStartTag() when you want to skip the body evaluation that is it must be returned when the TagLibraryDescriptor file contains the element empty, the value “empty” shows that there will always be an empty action.doAfterBody() is used to control the reappraisal of tag body. JSP Iterator – TLD should be in WEB-INF. Created JSP file should be in web.xml . 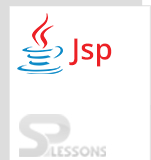 JAVA file should be under JSP java resources folder.